Egypt's President Abdel-Fattah El-Sisi met on Tuesday afternoon in Cairo with Sudanese first vice president and minister of defence Awad Ibn Auf and Sudanese chief of national security Salah Abdallah Gosh, the Egyptian intelligence announced. 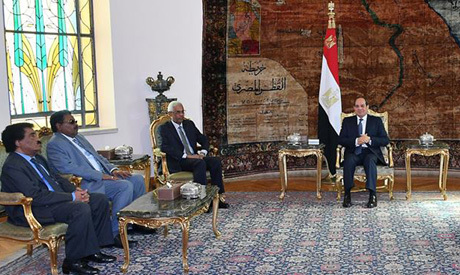 The Sudanese officials discussed with the Egyptian president ways to boost bilateral relations as well as recent developments in the region. According to the Egyptian presidency, President Abdel Fattah El Sisi asserted during the meeting that Egypt fully backed Sudan's stability and security. Auf, for his part, hailed Egypt's unlimited support to Sudan, saying that his country is looking forward to benefiting from the Egyptian leading role in the region and its inspiring development experience. This is the first visit for Auf to Egypt as the first vice president of Sudan. The meeting was attended by Foreign Minister Sameh Shoukry and Head of Egypt's General Intelligence Service Abbas Kamel. Sudanese ambassador to Cairo Abdel-Mahmoud Abdel-Halim attended the meeting.